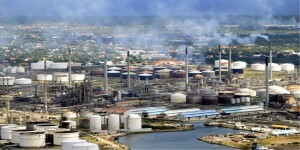 WILLEMSTAD - According to a press release emitted by the government, a so-called 'non-disclosure agreement' was signed between 15 interested parties and the public company Curaçao Refinery (RdK) to ensure the continuation of the refinery until the end of 2019. In less than two months, at the beginning of September, it will be clear which candidate is the most suitable. A transparent and clear selection will be made for this, as announced. In early October this will have to result in the signing of a Memorandum of Understanding (MoU). "In the meantime, every effort is also made to have a 'High-quality investor's data package' ready for the strategic partner who wants to take charge of the policy, business operations and modernization of the refinery after the end of August.” The press release indicates that at the end of this year it will have to be clear which company will continue with the refinery after 2019. And in the second quarter of 2019, an agreement will be signed for this." The fifteen selected parties now enter the trajectory of inventory and identification. This involves an intensive period during which the companies can get more information about the Curaçao refinery in a so-called virtual 'data room', but installations can also be visited and questions answered. At the same time, RdK, assisted by IHS Markit, will screen the companies through due diligence and negotiations will begin. RdK explains that PdVSA, which currently operates the refinery, is open to a third party until the end of 2019. "PdVSA is important in the search for a third party and that is why we will soon continue the dialogue recently started in Caracas." The press release also stated that with this process the government and RdK are still on schedule. For the search for the third party, the so-called 'Awarak' project, which now has to guarantee the continuation of the refinery, an information packet was sent to around 90 companies on June 25. Before the July 9 deadline, a total of 22 companies showed interest, 15 of which have now been selected. Among these 15 interested parties is a diversity of companies and consortia that do refining, trade in oil products or act as brokers.